OSTUNI (BR). 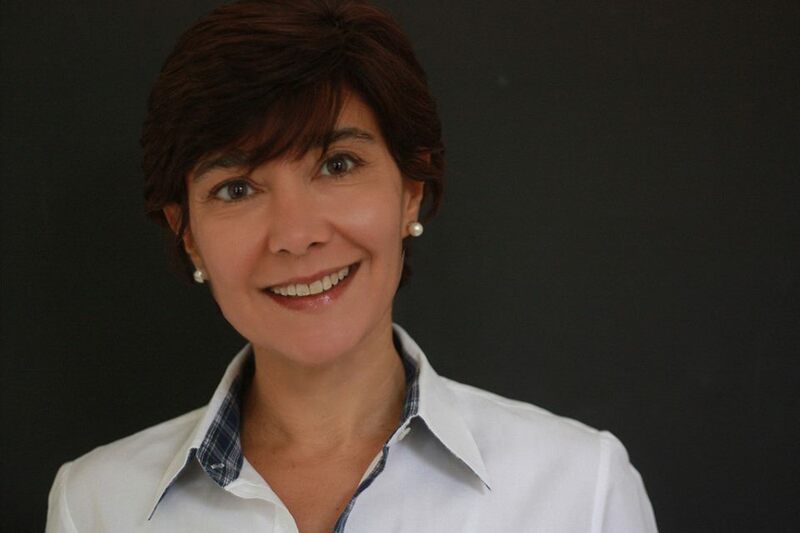 Si terrà venerdì 31 agosto alle ore 19 nella suggestiva cornice del Giardino dei Vescovi, interno al Museo Diocesano di Ostuni, l’incontro letterario che vedrà protagonista Valeria Vescina e "That Summer in Puglia", suo primo romanzo. Edito da Eyewear Publishing, il libro racconta di una grande storia d’amore e dell’avvincente ricerca dei motivi che l’hanno condotta alla fine. Ambientato tra il Sud Italia e Londra, "That Summer in Puglia" ha esordito nella sezione "Italian Day" al Festival Letterario di Oxford FTWeekend 2018. Presentato successivamente a Londra presso Waterstones Kensington e l'Istituto Italiano di Cultura, continua a ricevere ampi consensi di critica. "That Summer in Puglia" tratta del dolore della perdita e del potere dell'amore nelle sue molteplici forme. La Puglia si offre come sfondo ideale a diversi livelli di lettura: emergono le stratificazioni del tempo con antichi segni che diventano parte integrante del racconto e terreno di scavo nel passato di un uomo. Con il ricordo affiorano in Tommaso, sempre più vivi, colori, profumi e sapori di una terra generosa e memorie di un grande amore corrisposto, un fluire di sensazioni perdute e improvvisamente ritrovate. OSTUNI (BR). 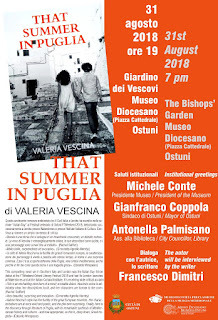 On Friday 31 August, at 7 pm, author Valeria Vescina will present her debut novel in the enchanting Bishops’ Garden of Ostuni’s Museo Diocesano. "That Summer in Puglia" (Eyewear Publishing) tells the compelling story of a great love and of the reasons for the ensuing heartbreak. Set in Southern Italy and London, "That Summer in Puglia" had its debut on Italian Day at the FTWeekend Oxford Literary Festival 2018, and its London launches at Waterstones Kensington and at the Italian Cultural Institute. It’s receiving wide critical acclaim. "That Summer in Puglia" is a tale of loss and of the power of love in its many forms. Puglia offers an ideal setting for a book written at multiple levels: the region’s layers of history are integral to the story, itself an excavation of a man’s past; Tommaso’s increasingly vivid memories of its sensuous colours, aromas and tastes, and of how it felt to love and be loved, and to grieve, eventually overwhelm and transform the discomforting tone with which he at first tries to keep Will – and painful truths – at a distance. Michele Conte, President of the Museo Civico, and the Mayor, Gianfranco Coppola, will make short introductory speeches. The event will take the form of a conversation between Valeria Vescina and Francesco Dimitri, another London-based Apulian author, whose work spans several genres. 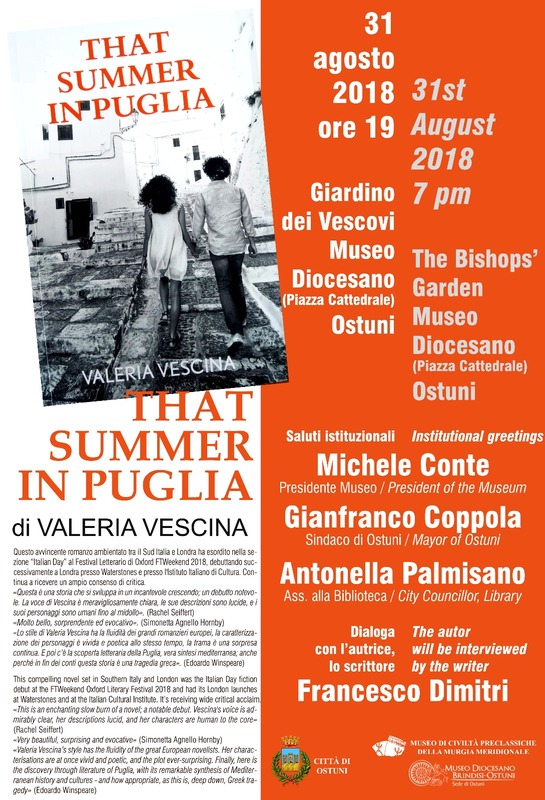 The presentation of "That Summer in Puglia", which we hope will engage the significant Anglophone community in and around Ostuni, will be conducted in both English and Italian.